Starring: James McAvoy, Anya Taylor-Joy, Haley Lu Richardson, Jessica Sula, Betty Buckley, and more. What do you think when you hear the name M. Night Shyamalan? Overrated? Genius? Predictable or unpredictable twists? ‘Signs’? ‘The Sixth Sense’? A first thought can run rampant and all over the spectrum of good or bad. With the most recent of times, my first thought would be and was, “Ugh, not again…” For me, his latest movies have been less than satisfying, especially ‘The Visit’, his most recent work. Now, we have the opportunity to see ‘Split’, Shyamalan’s newest film that has generated significant buzz among the crowds. So now, does Shyamalan restore the notoriety he once had during the earlier days of his career or will ‘Split’ continue the wondrous streak of films like ‘Avatar: The Last Airbender’, ‘The Happening’, and/or ‘The Visit’? Well, it is about time for ‘Split’ to get Oberrated. When three girls are kidnapped by a mysterious man (James McAvoy) and end up in an unknown location. Claire, Marcia, and Casey (Haley Lu Richardson, Jessica Sula, and Anya Taylor-Joy) must figure out a way to escape before the worst happens. The situation gets worse when they realize that this man is not only one, but he has multiple personalities. Creating a difficult situation in the form of them figuring out how to interact with this individual. Just to reiterate, Shyamalan has not impressed me with his most recent works. I went into ‘Split’ very interested in the material presented in the trailer and especially with how McAvoy was going to approach a character with DID (Dissociative Identity Disorder), but regardless, I had very low expectations. Upon finishing my viewing of ‘Split’, I was incredibly impressed and satisfied with the film. Shyamalan (finally) delivered a film up to par with his classic works. 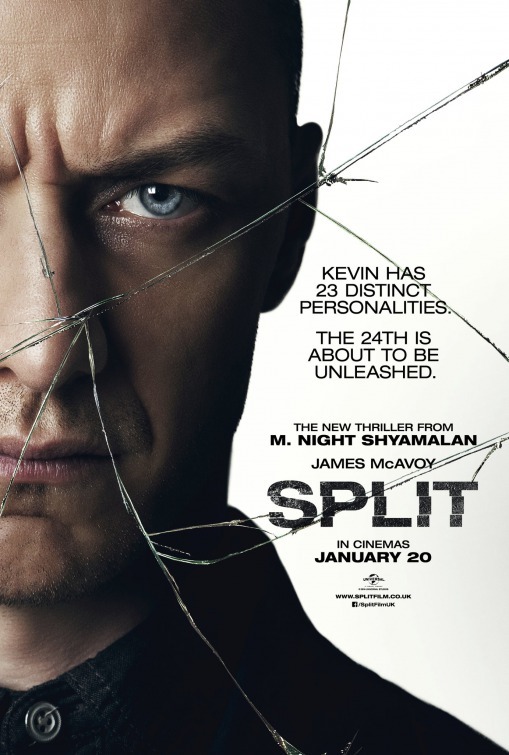 I felt immersed in the story of ‘Split’, and that is strongly due to James McAvoy’s performance, hands down. James plays a man with twenty-three different personalities. Within the film, we see him actively portray nine of them and some were even coexisting one after the other. It was simply astounding to witness him play this role. I truly felt I was watching a different actor each time until returning to the fact that this was still THE James McAvoy… Beyond the endless praise I could deliver for James, outshined but not to be forgotten, Anya Taylor-Joy remains to be one of my favorite newer actresses to hit the silver screen. Her character of Casey had a wide range of depth to her and was interesting to see develop… the story, as previously stated, is very well-done and immersive from start to finish… One only gripe I had with the film was that it seemed to lull for just a couple moments but it was hardly anything to alter my feel for the film. Shyamalan has come back with the fire. ‘Split’ is a sight to see and one I could watch over and over again. I hope to see Shyamalan continue this upward run and, as we have all come to expect and know of the director; lookout for a twist! Posted in 2017 Movies, Movie Review.